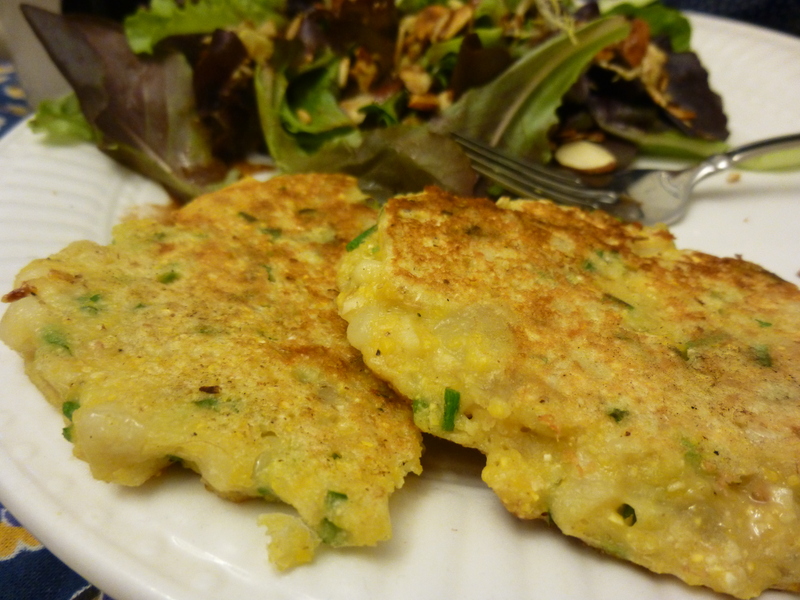 Possibly also known as corn fritters. The jury’s still out on that distinction (or I just haven’t consulted the right court)—I incline towards thinking of fritters as rounder and more fried and cakes a little flatter. In any case, it isn’t corn season yet but fortunately I still have corn from last season in my freezer. And now that all the fresh vegetables are coming up (salads with EVERYTHING) I feel comfortable using up the tasty foodstuffs frozen away. And I need space in my freezer anyway to make room for the buckets of pesto that summer shall endow. The possibilities for local food feeding all of us, by the way, are growing. Which is great, because “local” (i.e. less commodity-based) farmers tend to follow more sustainable practices, which is helping decrease global malnutrtion. And we sure do have some great local products! I favor using a mix of cornmeals here, as in most corny delights. Helps vary the texture. Similarly to pancakes, these are flexible, and take new additions and flavors quite well (within reason). Chives are fabulous, as are most green onion-types. Or you can go the other way and add a little sugar, maple syrup, or top with molasses. Mix the dry ingredients (including corn kernels and chopped chives) in a bowl. Stir in the hot water and let sit for a few minutes, then mix in the egg. Adjust liquid as necessary so the batter spreads enough in a pan. Heat up a flat pan with a good bit of oil (more if you want to make actual fritters), and put the batter in the pan like pancakes. Cook for a minute or two then flip and cook again. Repeat with the rest of the batter. Yum. Finding more ways to use that endless cabbage! I love crepes and had been thinking about making them for a while, but I sometimes have a hard time getting everything together for breakfast, which is usually when I make crepes (the sweet version, with lemon and sugar or berries). I keep trying to figure out new ways to use cabbage (cole slaw, braised, baked, with a variety of spices… there are a lot of options but it still can get tired), and when I remembered that I have Maine flint cornmeal from Songbird Farm I knew that was it. One of the challenges of vegetarian meals is making them exciting centerpieces. Meat is the star feature of many dishes, but obviously it’s hard to have that without the steak, or whatever. Sometimes something else can be the star (goat cheese, ripe tomato, beans…), but it is rarely something like cabbage, and while that somehow makes my liberal egalitarian self feel a little guilty, I think it’s okay (honestly, turnips are just not as tasty as other vegetables. Sorry, turnips, just being frank. I still like you sometimes you’re just a little harder to figure out). So that means the whole dish needs to shine. Fortunately, crepes do the trick. They are also not as difficult as you may conceptualize. Just whisk all the batter ingredients together and pour into a tilting pan. You can try to get fancy while flipping, but to be honest I still use a spatula—it’s more reliable. Getting the temperature of the pan right can be a little tricky, but once you get it they cook quickly and you can make them almost perfect every time. Start with the cabbage. Chop into fairly small pieces (I usually slice from one end about 1/4 inch thick, then go back and chop it up the other direction as well). Chop up the onion as well, in in 1/4-ish inch squares. Heat oil in a large pan and toss in cabbage and onions. Stir to coat the veggies in oil, and let them cook while you pull out the spices and throw them in as well. Stir, taste, and when the cabbage is getting soft, mix the miso and soy sauce together (this will make it easier to distribute the miso, which can get clumped up) and stir into the cabbage. It should be fairly soft by now; take off the heat and set aside (nearby) while you make the crepes. Cut up the cheese in small pieces (or grate) and have at the ready. Melt the butter in whatever pan you will be cooking the crepes (small nonstick is best, mine’s a little too big so I have to be careful when spreading the batter and it’s not perfectly circular). Mix the dry ingredients in a bowl. Measure out the eggs, milk, and water (I do this in a 2-cup measuring cup, which works perfectly—3 eggs is almost exactly 2/3 cup, and then you fill up the rest of the first cup with water, and add a cup of milk) and whisk them together. Pour the wet ingredients into the dry, and whisk until almost smooth (you can also do this in a food processor). Carefully pour in the melted butter (it should be melted by now, and the pan will be hot and buttery, which is important) and whisk immediately to prevent the hot butter from cooking the rest of the batter. Return the pan to the heat and make sure it is hot. The batter should be smooth and very liquid. With a ladle or a small (say 1/3 cup) measuring cup, dip out about 1/4 cup batter and pour into the pan, while simultaneously tilting/swirling the pan with your other hand (watch a video if that helps) to evenly spread the batter over the pan. For thinner crepes, add a little extra milk or water to your batter. Let cook for a few seconds (maybe 30), until the corners of the crepe start to curl up or the edges get a little golden. Carefully slide your spatula under the crepe, loosening the whole thing before trying to flip it over, then flip all at once and cook the other side for a few seconds. Just about right after flipping, scoop out a tiny bit of cabbage (maybe 1.5 tablespoons?) and place in the middle of the crepe. 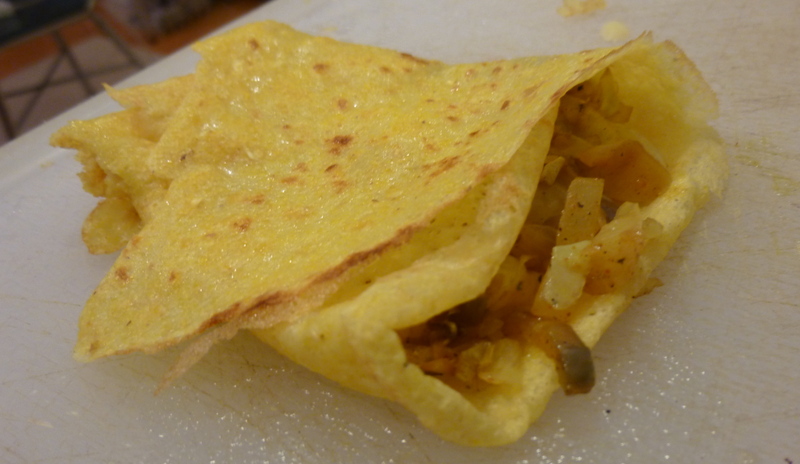 Top with a few small pieces of cheese, then fold the edges of the crepe over (bottom edge first, then the sides, to make a little pocket) or roll it up. Remove from the pan and either serve to hungry friends or put in a pan to keep warm before serving. Repeat with the rest of the batter! The cornmeal in these crepes tends to sink to the bottom of the batter a bit, so I recommend whisking before ladling out each crepe. If the pan starts sticking, add a little more butter and let it melt before adding more batter. Adjust the temperature if the crepes are cooking too slowly (not turning golden) or too fast (getting brown before you can flip them). I love having a gas stove. I admittedly never fill my first crepe with anything, but eat it right out the pan as fast as possible, since it’s extra buttery and sooo delicious. Make sure you don’t use bad butter, wouldn’t want a bitter batter. For normal crepes, just replace the cornmeal with flour. Great with Nutella. For these, though, next time I’m going to try using a little more cornmeal and see if it still works. On another note: I often find myself reflecting on the difference between animals and humans. While learning all kinds of information about the origins of agriculture and how it allows for the creation of cities, etc (irrigation is the key to civilization, thank you Mr. McAtee from 6th grade), I began to think that farming is the distinguishing factor (occupational favoritism, perhaps). However, this train of logic was refuted by a recent BBC article, which shows a large variety of animals that domesticate other living creatures. Fascinating. Still, it isn’t quite like our systems of agriculture, which perhaps have more of a conscious element. That may be closer to our real answer. What do you think?